I've been stuck on the Stug LT-15 and SPG-15 missions for months. The others I completed without hardly trying (like one of the earlier posters stated "just turn them on and eventually they'll happen" ). I don't like playing LT's or SPG's so these two have been an "annoying gnat in my nose" for too long. I just want to complete either one, get a fourth female crew and be done with the whole thing. I completed the LT-15.1 on Redshire with my Ru251. I was spotting over by the fort and as the medium tanks kept going through the entryway and the little ditch there, I spotted them and our arty and TDs just hit, tracked them, knocked out modules and proceeded to burn them down. I was killed 5 seconds before the end of the match so, no with honors, but I DID complete it. SPG-15.1 I completed on my Grille, also by coincidence on Redshire. It was just a very good game. I also got my first (and ONLY) mark of excellence on an arty and an Ace tanker. Just the planets aligned and RNG-zuhs was good to me. I think nice open spaces are best for those particular missions. Just keep playing the game and forget about missions. It is only a gimmick and you will eventually succedd at some point. I personally dont platton very often but when I do it's usually a beginner seeking the higher experience of my game totals in the beliegf that I will bring them great rewards and riches which is so wrong. Then I have the occasional time that I receive an platton invite with minutes to go before the game ends just so someone can achieve their mission with no regards to their poor game play. Oh and do not forget the game Bots those "intelligent bots" that each and everyone of you allowed to copy your actions. How often do you now move into your favoured position just to get wiped out instantly and you think, "Why?" For me and again it is only personal but just forget the missions and something will eventually happen when you put on the tinfoil hat. Have fun afterall it's not a charity for giving away free tanks but missions to be won over a longer period of game play and experience. Just recently thought I had completed TD-14 with honors for the T28HC, but it still shows as not complete. The requirements were to pen 4 consecutive shots (I had 5) and the secondary was to kill two (I had 3). Has anyone else had this issue? I have been on the 2nd MT-15 mission for about 7-8 months. I finished the first set of stug missions within 4 months of starting playing this game. I raced up and have literally nothing not done except the extremely hard LT missions (6 left) or the one medium mission. Why are these missions so stupidly disjointed in difficulty. One set of 15 missions takes 2 weeks and the next single mission takes x number of years for the same tank reward? I rarely if ever have enough hit points on the other team for the TD's. Overall these missions are brutally designed and it is ridiculous to have maybe 3-5 percent (less than that for the 260) finish these without cheating which is how most anyone got the 260.
did not receive credit for completing LT 13 Can't And can't post the screen shot due to the crappy interface of this forum. Looking for clarification for Object 260 Mission TD-2. Mission is to do at least 5000 damage and destroy enemy vehicles internal modules. I did over 5000 damage in my Tier 9 Swed TD and caused damage to 3 engines. Does this not meet the requirements? Edited by OC_192, Mar 31 2017 - 03:35. New arty missions require timed "stun" IE 80 seconds... this is not recorded anywhere in stats that I can find???? It lists # of stuns and damage while stunned but nowhere do I see that it even keeps track of TIME stunned. So how are we to complete? Gee, thanks for the help i guess, but do you have to be a such a [edited]about it. Edited by wookie_monster, Jul 02 2017 - 02:17.
yet again for I full month arrmo shaft 1st match. Battle achievements: Mastery Badge: "III Class"
fired 12 shots 0 gold cost of 1 shot 105 silver 12 = 1260 silver not the 33.600 I get charged every day over charged by 10 times . this has been going on for over 25 days now I have lost over 2 million silver. Completed the Memorial Day Flags mission, supposed to get 5 USA flags to use on any tank. Go to put them on some tanks, they aren't there, unless I pay gold for them. Where are my flags? Can someone tell me if I'm missing something here? Trying to complete HT-8 (T-28 HTC) and I can't figure out why this mission isn't completing. Why you can't understand that you didn't get 2000 damage to HEAVY enemy tanks? I guess I missed the word "heavy" in the mission requirements. Next time I will check the requirements more carefully. Otherwise, I might end up looking a bit silly, a bit like the kind of person who types "feature" instead of "future"
Edited by wookie_monster, Jun 03 2017 - 15:17. 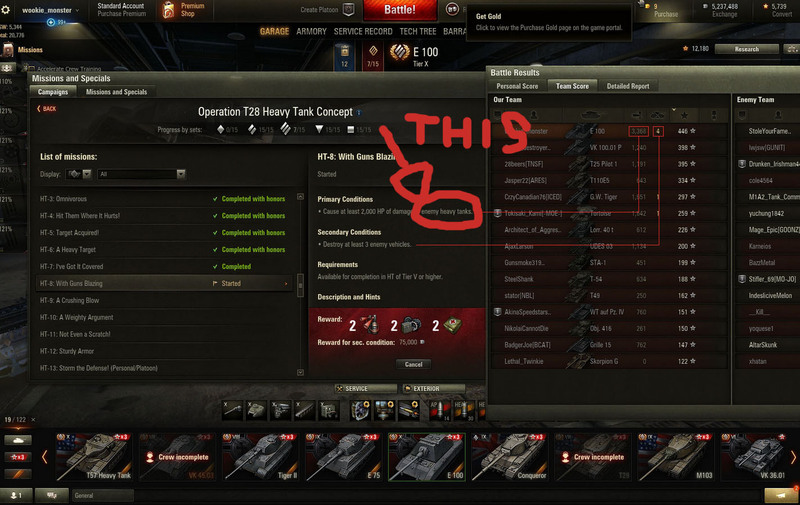 Anybody noticed, or have a solution (beyond selecting a different grouping) about T28 campaign crew members in a HT? Japan, China and France have only Premium or Tier X tanks in the decision tree, and Sweden has no HT available. Or am I missing something. You need to select the nation, tank type, which tank, and crew specialty to recruit the female crew member. * Orders were credited to players for all previously completed final missions with honors. However, if you skipped any of the branches at completing the campaign, these orders will be considered as committed.By recompleting these missions, you do not get the Orders as you've already move onto the next campaigns. Unfortunately, Customer Support will not be able to add/remove or credit Orders to an account. We have forwarded feedback regarding this issue since this condition wasn't stated in the patch notes. 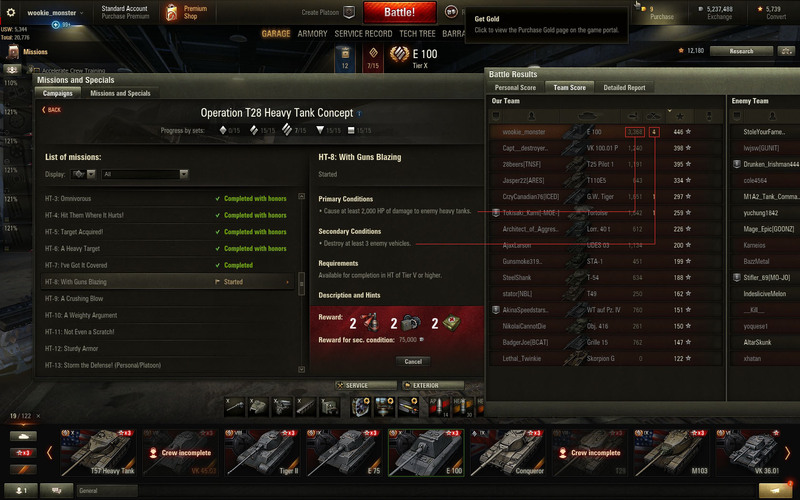 i was not credited for the mission Light 7, T28 concept even though i killed a BC 155 55. see image. Edited by baengi, Oct 22 2017 - 04:07. Thanks for your help. I hope someone can either confirm I'm missing orders or can show me where they are because it's very puzzling.